Operating an irrigation system can be expensive, with one of the primary factors being the cost of energy. However, significant savings can be realised by leveraging available technology to provide an appropriate electric motor and variable speed drive combination that will reduce operating costs while providing reliable performance. WEG IE3 top premium efficiency motors and variable speed drives (VSDs) from Zest WEG will do just that. 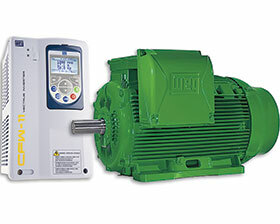 For example in a pivot pump application which operates for 4000 hours in a single year – relative to two planting cycles – WEG IE3 top premium efficiency motors not only offer maximum ingress protection with a higher winding insulation system to increase motor life expectancy, but also offer efficiencies of up to 96,6%. Benefits can also be seen when compared against IE1 standard efficiency motors. Using a 22 kW 2 pole at 75% of full load, an IE1 motor with an efficiency of 91%, measured against a WEG IE3 motor with 93% efficiency, has estimated savings of R2100 per year. Much higher savings can also be realised by using a WEG VSD in combination with a WEG motor. An IE1 electric motor, again operating for 4000 hours per year at 91% efficiency, will consume about R93 800 worth of energy using old technology. The same performance could be achieved using a VSD to reduce the motor speed while reducing the energy absorbed. For a 10% reduction in operational speed using the VSD, further savings of 22% to 27% could be achieved. One of the most spectacular stunts ever achieved at a live music event in South Africa involved flying a replica helicopter across the stage at the Afrikaans is Groot festival at the Sun Arena in Menlyn, Pretoria, which was achieved using state-of-the-art automation and mechatronics technology from SEW-Eurodrive. Sheffield-based engineering firm, SCX, helped to deliver the retractable pitch. Simex contracted Tectra Automation to upgrade software, supply new hardware and adjust and convert a portion of the motion logic control across three flight smulators. The Mars helicopter technology will lay the way for many future scientific and exploratory missions to Mars. Siemens is launching the brand new Sinamics G120X converter series for use in pump and fan applications in industries such as water, wastewater and building technology. The new ADXL series from Lovato, distributed by ElectroMechanica (EM), comprises modern, state-of-the-art, compact soft starters for three-phase motors from 7,5 to 160 kW in four frame sizes. Rockwell Automation’s Gauteng-based systems and solutions (SSB) team has executed two separate projects at a tyre processing plant in Port Elizabeth. The modernisation project was handled by Peter Huber, a full service provider of control solutions for sheet metalworking, and a Beckhoff solution provider since 2010. Industrial gear units and geared motors from SEW-Eurodrive South Africa are ideal for demanding applications such as agitators, mixers and aerators. BMG’s range of Nord aluminium drives is available with the Sealed Surface Conversion System anti-corrosion treatment. Rockwell Automation has expanded the power ranges and capabilities of TotalFORCE technology for its Allen-Bradley PowerFlex 755T AC drives. Parker is committed to helping customers become more productive and more profitable through its global offerings of motion and control products and systems.